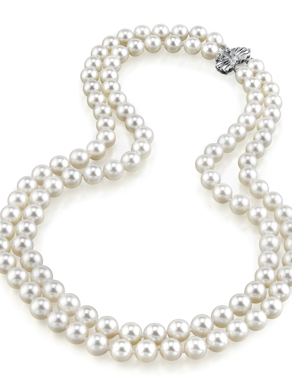 I passed a warm, delightful evening with a visiting reader, Dr. VO, who relayed a question from a friend in Seattle: what to do with her mother-in-law's double strand of classic white pearls, which she now owns. Just like a house, a reno project is wise only if the basic material isn't trashed. if the pearls have degraded to the luster of a peeled potato, it's too late. If, no matter what you do to them, you would never wear that gem or size, or cut, forget a reno. At the same time don't be shortsighted; even a small tweak can totally change a piece. Some renos can be done for $25, others involve thousands. It's worth spending to get it right, and, just like a house, to spend for design as well as materials. Your budget will go farther if you collect ideas of what you like before you begin, via sketches, photos or a Pinterest board. 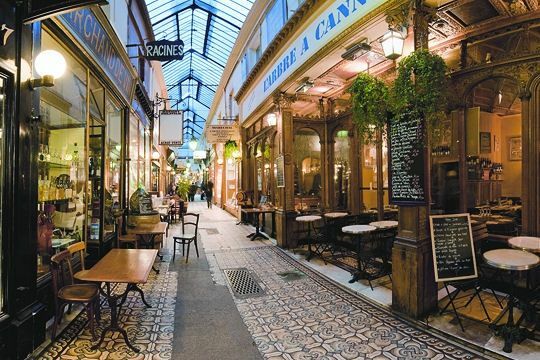 Over glasses of burgundy, I outlined three ideas that depend on those criteria, following the house-reno analogy. Option #1: "Wallpaper and paint"
Often, with sentimental gifts, the new owner wants to maintain the integrity of the piece while turning it into something she would wear; a zhuzh at reasonable cost is terrific fun! Have a jeweler restring (and clean, if needed) the pearls, possibly shortening the two strands to the right length for you. At around 20 to 22 inches, doubles can look staid (depending on your figure); taking off a few inches makes the piece more current and flattering. Add a new decorative double-strand clasp that complements the retro mood of the piece. Dr. VO said the pearls were from a German jeweler; I found a flower-motif coral glass and sterling silver clasp from Germany on sale from A Grain of Sand, for only $18.50. The movie-star vibe of a blue two-strand vintage clasp, $23 from beadtopiavintage, makes me want to buy pearls like Ms. Seattle's just so I can wear it. An all-metal style would work too, but keep it decorative; the idea is to wear the clasp to the side, so it's seen. Etsy is a terrific source for clasps and other findings; all Ms Seattle has to do is search "double clasp" in the jewelry findings section. 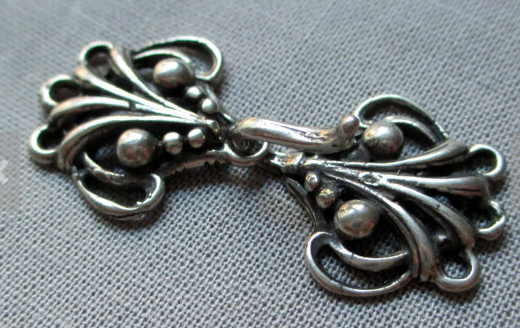 The vintage silver clasp fits one, two or three strand necklaces; an example of a simpler clasp that still has enough detail; from Etsy seller TheParisCarousel, $17. To change the clasp (sticking to the price point I've shown) and restring would cost around $50-$80. Option #2: "Knocking down walls"
Unless she has jewelry-making skills, here is where she calls in a pro. She could combine the two strands to make one long rope, if the pearls are at least 7mm. (If smaller, a rope will look rather jeune fille but could be worn layered. She could also add one of the cool clasps to the rope. 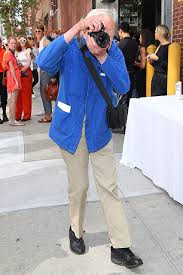 I suggested she contact Sarah Canizzaro at Kojima Company, because Sarah has a great eye, a vast array of unique pearls and a team of talented jewelers. Budget will vary depending on number and type of pearls added; the $250ish range is achievable. 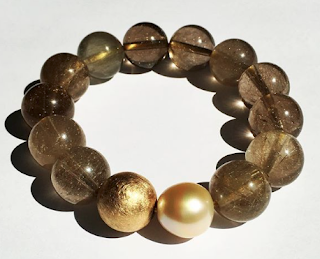 Option #3: "Repurposing the space"
Like the nook under the stairs that becomes an office, she could make several different pieces from the pearls, such as a multi-strand bracelet and a single-strand necklace. The bracelet could be classic but informal, like the bauble-charm bracelet at left, or ethnic-cool, like the memory-wire piece with brass beads below. I'm willing to guess there are Seattle artisans who can make such pieces; check the local bead stores or craft associations and only talk to artisans whose other work makes your pulse rise. For a single strand necklace, I have posted ideas here. There are way pricier renos such as adding a stunning custom-made clasp, or the addition of gem or gold spacer beads—diamond rondelles, anyone? But who wants to over-improve and end up with a huge bill? So I'm not going there in this post. I'm hoping that Ms. Seattle's project will be like a successful house reno: she'll get something she can live in every day, with joy and a satisfying return on the investment. Another fascinating jewellery reno post. I love the idea of adding a stand-out clasp to spice things up if the wearer wants to continue with the necklace. 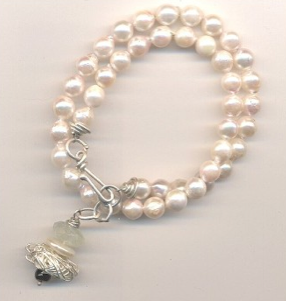 I remember the fabulous clasp you had designed for a pearl necklace some time ago - it was a stunner. The wrap bracelet is gorgeous - it would look wonderful with 3/4 sleeves in the summer. For of all, I am honored that you took time time to put together so many creative and inspiring ideas for this post., for I am Ms. Seattle. My MIL pearls are three stands of lengths ranging from 17.5" to 19", approximately 56" total. Your analogy under wallpaper and paint of "wanting to maintain the integrity of the piece while turning it into something I would wear" is my sentiment exactly. The necklace has a large round, rather ornate clasp with 28 small diamonds. I'm quite inspired by all of your posts on pearls, and very much consider you the expert. So, I would very much appreciate your opinion on the idea of making the necklace into a two strand, about 27-28" in length, and using the clasp as a pendant? Would that be too long, outdated, or just not a wise choice overall? Thank you again, Duchesse for this post. I love that wrap bracelet, BTW. You could just eke out a double opera (27/28) length, if all the pearls are uniform, in good shape and if you can tolerate that much weight. Wear the triple strand all day and see. Otherwise I'd go for a shorter double using the best pearls. I don't often see a pendant hung on opera length, but it could work. However if used as clasp, that would create more length. I still don't know the size; a long strand of smallish pearls looks forlorn, even doubled. I suggest they be at least 7mm. If smaller, make a 16 to 18 inch (depending on your neck) double; keeping smaller pearls up high looks better. Or a bracelet with the clasp. Hope this helps, and feel free to e-mail or comment again. Sounds like you have a fascinating piece to work with! LauraH and Cynthia: That's the bracelet I bought for my son's sweetie for Christmas. The pearls are not fine but the bracelet is cool. From Amsterdam. Ms. Seattle - what about turning the clasp into a pretty ring? 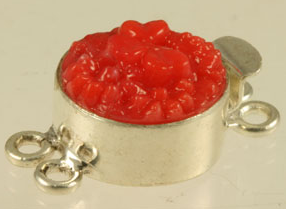 A jewelry shop I used to work at would do the reverse, turning rings into clasps, so perhaps this might be an option. I had lucked into purchasing a gorgeous triple strand from an estate that came into this shop, and turned it into one long strand with a rather simple clasp with a pink tourmaline. They are really heavy, though, so I don't wear them quite as often as I would like. It's fun to twist them into different necklaces, from a choker to a knotted single strand. You may want to buy some cheap beads from the craft shop and play with possible reno ideas first. Practice will make perfect. Gretchen: Thank you for the idea of turning the clasp into a ring, and vice versa! 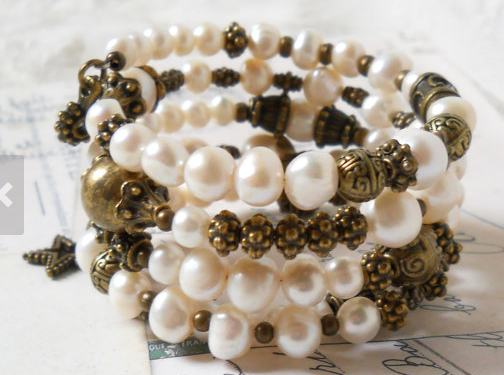 I prefer to keep the pearls and clasp together on this set for sentimental reasons. MIL loved pearls and left me another set, four strand, that she wore as a choker. The problem is that she was so small and petite, that I cannot get them around my neck! So, I thought of turning them into a three strand, and as Duchesse recommends regarding a small size pearl to keep them up high on the neck. This is where I am going to steal your brilliant idea of turning a ring into a clasp! Thank you, Gretchen for such great idea! 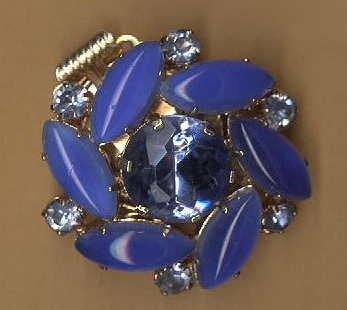 Gretchen: Once I saw the clasp, I too thought of a ring; it is a beautiful fine jewellery clasp. A long strand can be made with nearly invisible joins so it disassembles into various lengths, something to think about if one does not want to wear a 100-inch rope very often. Thank you for the lovely compliment, Duchesse, and once again for your advice.